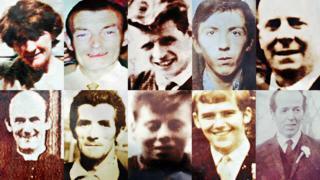 A former paratrooper has told the Ballymurphy inquest how he ran through cover to resupply his colleagues with ammunition, during a firefight. Witness M249 says he served five tours in Northern Ireland during the 1970s and never once fired his own weapon. The Lance Corporal attached to B Company told the court there had been sporadic gunfire and disorder around Henry Taggart Hall on the day internment was introduced, on 9 August 1971. He had earlier been assisting other soldiers carrying out internment arrest duties and had taken part in a static patrol in Springfield Park. He recalled two shots being fired at his platoon by a man during that patrol. Later, he said, he spent most of the rest of the day on reserve inside Vere Foster school. The ex-paratrooper and his platoon were upstairs in a former classroom watching the television news to try and find out what had been happening in the area that day. At one point, a bullet came through a blacked-out upstairs window, struck a metal locker and ricocheted into another soldier, whom he then took downstairs for first aid. M249 felt the bullet must have come from the Ballymurphy area. Downstairs in Vere Foster school he briefly observed scenes in the B Company Operations room and noted that the radio was busy with messages from other soldiers. At this point, M249 said he was asked by a Colour Sergeant to take his reserve platoon's ammunition down to the nearby Henry Taggart Hall in case it was needed by B Company. He remembered running bent-over through long grass to get there, avoiding the existing path, in case he became a target, and climbing through the back window of a storeroom. M249 also remembered there were several shots towards the base as he ran, but which he did not think were aimed at him. He did not observe any gunmen at any time. In the Henry Taggart Hall, he delivered the ammunition to a sergeant and learned that there had been a gun battle and that civilians had been shot. He then noticed four civilian casualties, lying on stretchers and who were receiving first aid. M249 said he believed one of the casualties was already dead. He also said that no one told him who they were, and that he did not ask. He does not believe he saw a woman casualty. Joan Connolly, Noel Phillips, Joseph Murphy and Daniel Teggart all died as a result of gunfire around the Henry Taggart base that night. Others were injured, some seriously, including an 11-year-old boy. M249 said he returned to Vere Foster school where his platoon now had no further duties, because they had given away some of their ammunition. He later denied to a barrister for the family of Joseph Murphy that he was in fact a soldier named "Soldier D' in 1971 and who had fired his weapon. "I did not fire one single round" he said. Later, another witness, M157, described trying to establish where incoming fire to Vere Foster school might have been coming from. A corporal in B Company 2 Para, the soldier had been sent to the school playground to try and watch Moyard Flats for signs of gunfire. He said that he took cover behind a wall and watched for some time. He added that although there had been shooting and fire returned from an army sangar on the roof of the school, he heard nothing when he was in the playground and could not locate any gunman. He was later returned to other duties. M157 said he had no memory of any casualties in the area that night, but had "heard stories" in the weeks following. The former soldier served two tours in Northern Ireland and stated that he did not fire his weapon in either of them. He added that whilst he had some memories of the time, he could not clearly remember which day the events happened, and hadn't previously linked them in his mind with the introduction of internment. "It's annoying not to be able to remember what actually happened," he said.